Swing gate turnstile is popular among businesses in Singapore seeking for a Medium-security barrier turnstile gate access control system for their building front entrance reception. Such a half height turnstile gate provides the security and functionality of a full height turnstile, while at the same time, maintains a welcoming industrial design of a Tripod turnstile, which exudes an atmosphere of architectural openness. 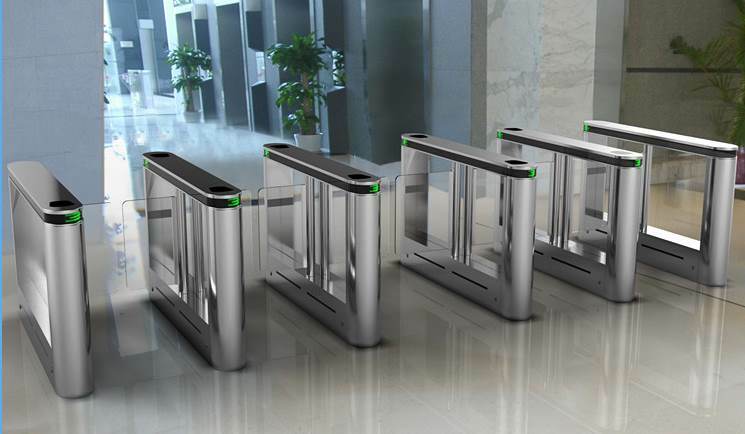 Similar to a Speedgate, Drop Arm barrier, and Flap Barrier, it has a durable design which is suited for entrance access control deployment in premises which Frequently involves a relatively large volume of human foot traffic access, and requires a medium level of authentication security. As it is weatherproof, it can withstand harsh operating outdoor conditions, allowing it to be suitable for installations in both interior and exterior locations. The swing gate’s servo control system consists of a Lossless DC brushless motor mechanism which helps to provide an Accurate mechanism control, Stable engineering performance with minimum periodic Repair needed over a long-term usage period. It has a durable and quick gate operations enables it to efficiently manage a large flow of foot traffic flow. Our swing gate turnstiles feature an aesthetically pleasing slim design form factor which allows it to blend in with the surrounding architectural design. T3 Security Integration is a Leading Security Solutions Provider in Singapore. We Help Clients in Various Commercial and Residential Projects with a Focus on Integration, Reliability & Cost Effectiveness Implementation. In the event of an emergency building evacuation, the turnstile gate barrier swings open automatically to facilitate a free unhindered passage to safely evacuate occupants in the building. This includes security incidents such as due to Fire outbreak, Power failure, or Terrorism etc. When an impact force exceeding the safety range is suddenly exerted on the Swing gate barrier, it has a safety motion damping design to protect the pedestrian from any possibility of impact injury. All internal electric modules are designed to function normally under the safety voltage of 24V and are designed with built-in residual current protective devices to effectively mitigate any electric shocks. Advanced photoelectric stereoscopic detection sensors can be added to enhance safety and security functionality of the Swing gate turnstile. In the event any of the above illegal activities are detected, a barrier auto-lock feature will be activated. In addition, an Audio and Visual warning alarm (ie. Sound, light) will also be triggered to alert intervention by nearby security personnel. The swing gate turnstile has built-in authenticating Access control readers which can easily conveniently integrate with your building entrance’s existing security systems. The swivel swing gate can be configured to control its Opening & Closing direction for allowing physical passage in one direction or in both directions.